This post is from 2017. 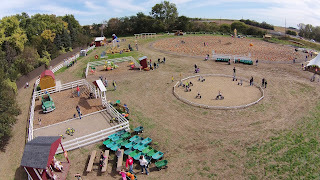 For updated hours, admission fees, and attraction lists, please see the 2018 Siouxland Pumpkin Patch Post. One of the best parts of living right in the middle of some of the world's best farmland is access to amazing pumpkin patches! Here are some of the great pumpkin patches within a 2 hour drive from downtown Sioux City, listed by distance from downtown Sioux City. This roundup will be updated as more information about 2017 pumpkin patch hours, rates, and events are available. Please e-mail me if you own or operate a pumpkin patch and would like to update your entry or add a patch to our list! Directions from downtown Sioux City: Take US-20 East to Lawton, then turn left on Charles Ave. Scarecrow Farms will be on the right. Costs: Admission is $9 for ages 3 & up and free for ages 2 & under, firepit rental is $30 for 3 hours, shelter rental is $60 (small shelter) or $120 (large shelter) for 4 hours, and zipline $12 per ride or $29 for 3 rides by the same rider. Everything but the firepits, ziplines, shelters, and food/gift purchases (including pumpkins and apples and anything from the Treat Shack) is included with the admission price. Discounted admission available for groups over 20, just call to discuss options! Fun Features: At Scarecrow Farms you'll have fun with the pumpkin patch, hay maze, hayrack rides, mini train, ghost story barn, tire swing, corn box, trike track, jumping pillow, petting zoo, pick your own apples from their apple orchard, plus there are hot drinks like apple cider and more treats for sale in the Hay Stack Treat Shack including pie and carving pumpkins, pumpkin carving tools, gourds, squash, apples, local honey, hay bales, jams, jellies, salsa, cold bottled sodas and root beer, and much more! For more info: Visit the Scarecrow Farms website and Facebook page and check out our post about visiting Scarecrow Farm. We had so much fun! Directions from downtown Sioux City: take Hamilton Blvd north. It will become K-22, stay on it. Then, turn left on C-12. Costs: free other than pumpkin etc purchases! 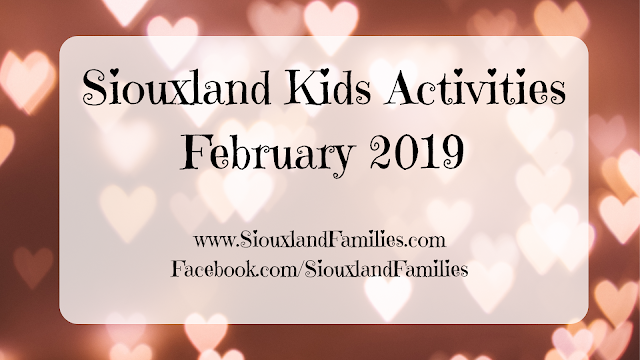 Fun Features: Hay rides, petting zoo, and painting. Fun for all ages! 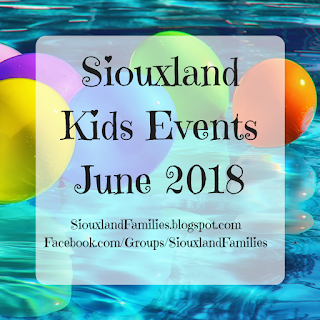 Fun Features: Bounce houses, corn pit, petting zoo, and train rides all free with admission. Grass fed beef, soup bones, jerky, steak, goat meat, and more for sale, as well as spicy chili pepper powder ranging from mild to the intense Scorpion Ghost pepper powder (just typing it scares my taste buds, but I bet my husband would love it)! There are also handmade bead, sstone, leather, and horsehair crafts for sale at their Country Market. Dates open: September 29-Oct 31, open on Tuesdays, Wednesdays, and Fridays from 3-7pm and Saturdays and Sundays from noon-6pm. Lighted Corn Maze open Sat 10/14 from 7:30-9:30pm. Haunted Corn Maze open Sat 10/21 and 10/28 from 7:30-9:30pm. Fun Features: Based on past years, visitors should expect dozens of varieties of pumpkin, squash, and decorative corns, hay rides, a corn maze, and lots of cute selfie opportunities! In the past a special haunted corn maze has been a big hit on the weekend before Halloween, and Family Fun Nights featuring smores and hot dogs around a bonfire! There is also a gift shop featuring handmade bread, cookies and popcorn balls, plus candy, bottles of pop and more. Directions from downtown Sioux City: Take US-75 South to Winnebago, then at the roundabout take US-77. Harvest Moon is on 77 and should be on your right. Fun Features: At the picturesque Harvest Moon, you'll find not only pumpkins but also a 3 acre corn maze, giant jumping pillows, go-karts, basketball shoot-outs, giant slides, ziplines and much more! Costs: Admission to the pumpkin patch, mini maze, petting zoo, and store is free. Large corn maze is $6 for adults, $5 for ages 5-12, and free for kids 4 & under. Firepit rental is $10 if you bring your own wood or $20 if they provide firewood for you. Fun Features: In addition to many varieties of pumpkin, squash, and decorative corns, Pumpkinland also has a 7 acre corn maze plus a mini maze, a petting zoo, many cute photo opps, and sells a variety of jams, jellies, baked goods and seasonal decor in their store. Dates open: Everyday from Halloween to Labor Day. Mon-Fri 11am-6pm, Sat 9am-6pm, Sun 1pm-6pm. Evenings by appointment! For more info: Check out the official Solsma Punkin Patch website and Facebook page for the latest details on fall fun at Solsma's! There is an awesome pumpkin patch near Omaha named Vala's which I am not including because it is over 2 hours away. 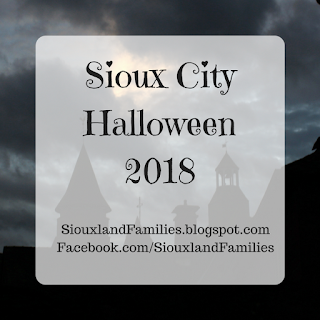 Many Sioux City area families love to visit it despite the distance, and you can find more info on Vala's from Omaha based bloggers The Walking Tourists and Family Fun in Omaha! 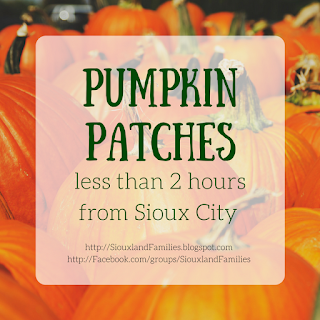 Diane's Pumpkin Patch is north of Sioux city on K22 about 45 miles. And there's no charge to get in.